If you do not see your insurance listed, please contact our office at 1-800-331-1612. We are adding new insurance contracts regularly, and our office will be able to help you determine if our physicians participate with your plan. All plans must be verified prior to visit to ensure coverage. After working with patients and their insurance companies for years, Arizona Oncology knows that understanding insurance can be difficult. On this page you can find information on the health plans we accept and a few health insurance industry definitions. We work with a variety of health plans and insurance companies including Medicare, Medicaid, Employer Group and Health Insurance Marketplace plans. To find out if we contract with your insurance company, please view our Accepted Insurance Plans list or contact us. Health Maintenance Organizations (HMOs): HMOs are organized systems for providing healthcare in a geographic area. They have a set of basic and supplemental preventative and treatment services; members generally select or area assigned a primary care physician (PCP) who, in some plans, is responsible for making referrals to specialists. HMOs offer no "out-of-network" benefits which means you may be only able to obtain care out of your service area if it is a medical emergency. It is important you check with your plan as your service area may be limited to a specific county or a state. Out of pocket expenses (patient responsibilities) for HMOs include deductibles and co-payments. Indemnity Plans: Indemnity or traditional insurance is not considered "managed care." In indemnity plans the member chooses his or her own providers. Oversight of care by the health plan is minimal. The member's out-of-pocket payment is generally higher with indemnity coverage and includes deductibles and co-insurance amounts. Managed Care: A broad term that describes insurance plans designed to manage the cost and quality of health care. Most health insurance today is referred to as managed care. Ideally, managed care creates a comprehensive healthcare delivery system that includes hospitals, physicians, lab companies, etc. PCPs refer patients to our physicians or patients select a physician in the health plan network directory to receive the needed care, including preventative care. The plans vary from restrictive or narrow provider networks (limited hospitals, physicians, etc. ), to fairly large provider networks. Health plans also vary from low choice/low out-of-pocket costs to high choice/high out-of-pocket amounts. Medicaid: The State health insurance program for low-income individuals, the indigent, and elderly. In Arizona, our Medicaid program is called Arizona Health Care Cost Containment System or AHCCCS. 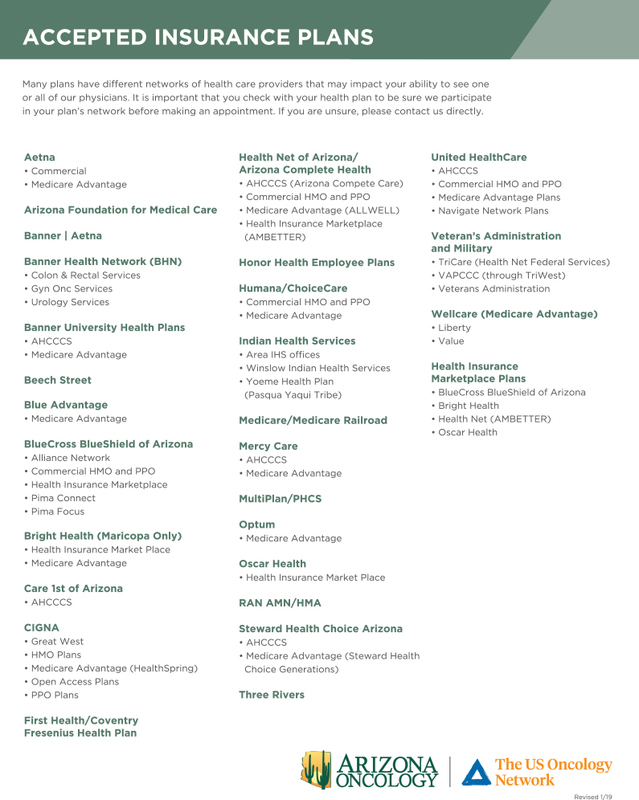 Most AHCCCS patients belong to, or are automatically assigned to a Managed Medicaid or Medicaid HMO plan. Medicare: The federal health insurance program for older Americans and eligible disabled individuals. Part A covers services like hospitalization. Medicare Part B covers services like lab services, radiology, durable medical equipment and physician services. Individuals must sign up with Medicare for Part B coverage and pay premiums to Medicare for this coverage. Medicare is one of the last traditional indemnity plans that exists today. Patients covered by traditional Medicare (Parts A and B) can purchase a supplemental plan to cover the patient out-of-pocket expenses not covered by Medicare. Patients can also choose to “assign” their Medicare benefits to a Medicare Advantage plan (HMO or PPO) plan. Medicare Advantage plans are considered managed care plans. Most Medicare Advantage plans require premium payments and have some additional level of patient financial responsibility including co-pays, co-insurance and deductibles. Point of Service (POS): POS plans build on the HMO concept. Simply put, if a POS patient stays within the defined network and receives referrals from his/her PCP, the plan acts like an HMO. If a patient chooses to seek care outside of the defined network (out-of-network), the plan then functions like a PPO with a higher out-of-network deductible and other out-of-pocket expenses. Preferred Provider Organization (PPO): PPOs generally provide "in-network" and "out-of-network" benefits and do not require a PCP referral to see a specialist. Usually, PPO plans come with both deductibles and coinsurance patient responsibilities. These patient responsibilities are lower when a patient uses in-network providers than it is for out–of-network providers. Affordable Care Act (ACA): Sometimes referred to as Obamacare, the ACA was established to ensure health insurance coverage was available to all US citizens. Besides mandating the availability of health insurance benefits for all US citizens, the ACA removes a health plan’s ability to deny coverage or charge patients more for premiums because they are or have been ill (no pre-existing disease clauses). It requires services like emergency room, maternity care and behavioral health become covered benefits. It also requires that preventative services, like well woman exams be provided at no cost to the patient. The ACA allows children to stay on their parent’s insurance plan until the he or she turns 26. It controls how much an insurance company can increase its premiums and limits how much money an insurance company requires patients pay before the plan starts paying for benefits (i.e., it limits the deductible). Future aspects of the ACA close the donut hole that currently exists in Medicare prescription Part D coverage. Co-payment: A defined flat dollar amount paid out of pocket for medical services. This payment is usually due at the time the service is received. Co-payments or co-pays usually apply to physician office visits, prescriptions, emergency or hospital services. Co-pays are usually associated with HMO plans and in-network POS services. Co-insurance: Co-insurance, like co-payments, is a common form of patient financial responsibility.The amount due is typically calculated as a percentage of charges a health plan will pay. Most often, patients will owe co-insurance amounts after the deductible requirements are met. Co-insurance amounts are lower when services are received from an in-network provider than an out-of-network provider. Co-insurances are usually associated with PPO plans and out-of-network benefits under POS plans. Deductible: The amount of medical expense a person must pay each year from his/her own pocket before the health plan will make payment. The deductible can be a separate amount for medical services and prescription services. Gatekeeper: Usually limited to HMO plans, a primary care physician serves as the “gatekeeper” of services by being the patient's initial contact for medical care and referrals to specialists. Health Insurance Marketplace: Sometimes referred to as Health Insurance Exchange plans, Individual plans or Obamacare plans, Marketplace plans are sold to individuals and small business groups through brokers or through “Exchanges.” Exchange plans are sold in different “metal” levels that identify how much on average a patient and the health plan will pay for every dollar spent on care. Patients who meet the financial requirements and sign up for coverage through the Health Insurance Marketplace can receive financial help with their premiums (i.e., subsidies) and potentially their out-of-pocket expenses (cost-share amounts such as copayments, coinsurance and deductibles). Narrow Network: A narrow or restricted network is a network of providers that is smaller than the network available under a different insurance plan or a different benefit plan. The choice of providers in the narrow network may be based upon a lot of different reasons including their willingness to accept lower payments, quality measures, the ability to coordinate care, hospital affiliations and other factors. The ultimate intent is to create a smaller network of providers that is more controlled than a large network and as such, the premiums charged for a Narrow Network plan should be less. The important point about narrow networks is just because a physician participates with the health plan, the physician may not be included in all networks. Out-of-Network Benefit: PPOs and HMO Point of Service plans contain an out-of-network benefit tier where a patient can choose a physician in or out of the service area who does not belong to the insurance company’s network. Out of network benefits usually come with a higher deductible and a higher co-insurance percentage. Additionally, out-of-network providers that do not have a contract with a health plan can choose to not accept the amount the insurance company will pay for healthcare services. Because of this, patients could be required to pay the difference between what the insurance company will pay and what the out-of-network providers bill for the care received (this practice is called balance billing). Under an in-network situation, the provider’s contract with the insurance company will not allow the difference to be balanced billed. Primary Care Physician (PCP): A PCP is a physician designated as responsible for providing specific primary care services. This includes decisions regarding referrals for specialty care. PCPs are usually family practice, general practice, internal medicine, geriatrics, pediatrics and, for AHCCCS plans, obstetrics and gynecology. Under the HMO health plan model, the PCP may also be considered the gatekeeper. These above terms are not comprehensive or universally accepted definitions. The terms are meant to assist the reader to understand concepts, programs, services and information relating to managed.